For The Situationist, Sabreena El-Amin (Harvard Law School student and President of the Student Association for Law and Mind Sciences (SALMS)), has authored the following legal analysis of the Trayvon Martin shooting and situationist analysis of the “stand your ground” doctrine. We are pleased to publish it and look forward to more contributions from Sabreena and other members of SALMS. The Trayvon Martin incident is of particular importance to me: not only as a Black person, not only as a law student, not only as a mother, but as a big sister. My younger brother is currently attending school at Barry University in Miami, Florida. He, like myself, loves Arizona Ice Tea. We are also both big fans of Skittles, though we have a particular preference for the sour kind. Most importantly, we both wear hoodies. I am now more nervous than ever for my brother: a 19-year-old black man walking the streets of Miami with a camera. With laws like the “Stand your Ground” statute, vigilantes like Zimmerman are free to roam the streets in Florida, singling out young black men and killing them seemingly without repercussions. My argument will focus on two main points: 1) Zimmerman should have been arrested as the prosecution will likely be able to meet their burden of proof that his action was not in accordance with the statute; and 2) the Stand Your Ground statute should be repealed because a) it encourages armed individuals to respond to situations violently and b) it sanctions the attack of Blacks. I will begin the article by outlining the facts as I know them. I understand that there are several different fact patterns floating around and the story is being developed daily. My arguments will be based solely on the facts mapped out below. I will continue by discussing why the facts would support the prosecution’s case, if one were to be brought, focusing mainly on a piece by Governor Granholm of Michigan. I will then go on to discuss the “Stand Your Ground” statute based on two psychological studies that show the statute endorses more violence than is reasonably necessary. Trayvon Martin, a 17-year-old Black male, was walking to his father’s home in a gated community in Sanford, FL after returning from a 7-Eleven convenience store. En route, 28-year-old self-appointed Neighborhood Watchman, George Zimmerman, spotted Trayvon and telephoned police that there was a suspicious young black man walking around. Zimmerman informed the police that the young man looked like he was on drugs and appeared to be reaching for something in his waistband. Initially Zimmerman claimed that the young man was coming right at him, and then that Trayvon was getting away. Zimmerman complained that “they” always get away. Dispatcher informed Zimmerman that they did not need him to follow Trayvon and Zimmerman said okay. Several residents of the area called in shortly after Zimmerman’s call to report that they heard screaming. In some cases, callers reported a black male lying on the ground. Each caller also heard gun shots and heard the screaming stop. One caller reported that there was a man in a white shirt on top of someone lying on the ground. Police collected Trayvon’s body, tested him for drugs, ran a background check, labeled him John Doe and placed him in the morgue where he would lie for over 24 hours before he was identified. Trayvon was unarmed and in fact only had a can of Arizona Ice Tea and a bag of Skittles. Zimmerman was questioned after the shooting, but never arrested. Zimmerman weighed 250 pounds and had a history of vigilantism. Zimmerman’s claims he was justified in his use of force based on this statute. It is not clear which clause Zimmerman’s defense is connected to. Zimmerman has, since the incident, secured legal counsel. Zimmerman’s lawyer asserts that Zimmerman is not a racist and that he in fact mentors Blacks. His lawyer also stated that Zimmerman is currently in hiding, but has not fled the country. According to Zimmerman’s father, Zimmerman identifies as Hispanic. Currently, Florida Governor Jed Bush does not believe Zimmerman’s actions are covered by the statute. There is a Department of Justice investigation in regards to the failure of the Sanford Police Department to arrest Zimmerman, President Obama has called for justice for Trayvon, and Sanford’s chief of police has stepped down. People across the country are expressing their distaste for the response to Trayvon’s murder and are, via protest, Facebook, articles, etc., calling for “Justice for Trayvon”. The “Stand Your Ground” statute essentially creates a presumption of self-defense in certain situations. Zimmerman has yet to be arrested because authorities do not believe there is enough evidence to rebut this presumption. I would like to focus this aspect of my piece on the following arguments: a) the facts of the case do not support a claim of self defense alleged pursuant to Fla. Stat. § 776.013(3) as Zimmerman appears to have been the attacker and not the victim, and b) the facts of the case do not support a claim of self defense pursuant to Fla. Stat. § 776.013(1) as Trayvon was unarmed and Zimmerman was likely acting unlawfully in his pursuit of Trayvon by misleading officials. Admittedly, only Zimmerman knows exactly what transpired during his altercation with Martin, and thus this argument may be moot after Zimmerman’s account becomes public. 1.The call from Zimmerman to law enforcement, and the officers telling Martin not to pursue. Zimmerman whispers what many have described as a racial slur under his breath. 2.There is a 911 call where you can hear a voice yelling for help and a firearm shot. 3.Trayvon’s father identified his voice on that 911 call on Al Sharpton’s Politics Nation program on MSNBC. 4.The account of the girlfriend, who says Trayvon told her by cellphone that he was being followed. 5.Trayvon was not armed and weighed between 75-100 pounds less than Zimmerman. The evidence that we know of — the public evidence — establishes that Zimmerman was the pursuer, and not the victim. In addition to this evidence, a 9-11 caller reported a man in a white shirt on top of a man lying on the ground. Another caller reported a man lying on the ground screaming “Help” and hearing gun shots go off before he got the chance to go to the man for help. Trayvon’s parents have identified this voice as their sons on the tape. Zimmerman, however, claims that this is his voice, but in connection with the other evidence (e.g., that he was the heavier of the two and that Trayvon was unarmed), this will likely be refuted. Based on the facts as alleged, the situation seems to have been initiated by Zimmerman. Even if Trayvon fought back after being pursued, his actions were justified based on the same statute that Zimmerman is currently hiding under. Section 1 of the “Stand Your Ground” statute creates a presumption of self defense if a person is doing something unlawful and the person using force knows or reasonably believes that an unlawful act is occurring or about to occur. There has been some discussion at my law school that if Zimmerman asserts that he witnessed Trayvon about to break into someone’s home then Zimmerman may likely have a claim. I think this is unlikely for two reasons. First, Trayvon was unarmed and, based on all available evidence, innocently walking home from the convenience store. In order for the presumption in section 1 to be triggered, the attacked must have been in the process of committing certain crimes. There has been no evidence advanced indicating that Trayvon was participating in any crime. In fact the evidence points to Trayvon being engaged in innocent activity. Second, section (2)(c) asserts that this presumption is unavailable if the attacker is engaged in an unlawful activity at the time of the attack. As the 911 tape shows, Zimmerman was told not to follow Trayvon and said “okay.” This act can be seen as misleading police officers, who were likely told by dispatch that Zimmerman would be waiting for them to arrive before doing anything further. This act is likely in violation of Fla. Stat. § 843.06, which makes the “neglect or refusal to aid peace officers” “in the preservation of the peace” unlawful. Zimmerman’s false compliance with the order may have delayed the response time of the dispatched officers and been the reason why the police were unable to respond to Zimmerman’s call in time to save Trayvon’s life. Arguably, Zimmerman’s actions show neglect to assist a peace officer and thus could qualify as unlawful acts that will exclude Zimmerman from the protection of Fla. Stat. § 776.013(1). I would like to start this section by clarifying two points. First, Florida is not the only state to have a version of the “Stand Your Ground” statute. According to the above-mentioned piece by Gov. Granholm, who describes the statute as “part of the American Legislative Exchange Council (ALEC)’s cluster of pro-NRA bills that shot through legislatures in the past few years”, Florida is only one of 17 states to have a statute of this kind. Secondly, studies suggest that it is very possible for Zimmerman to be a rational, tolerant, even intelligent, person and still to have reacted in the manner that he did. Many people have labeled Zimmerman a racist and even called him sadistic for his response to an innocent young boy. Sadly, while this may be true for Zimmerman, it does not have to be. Due to the freedom that this law opens up for people to act upon their fears, which may be based on their predisposition to certain opinions, I believe this law should be repealed immediately. Every minute that this law and laws like it remain on the books another Black person’s life is in jeopardy. In a piece entitled “Holding a Gun Influences You to Think Others are Armed,” David DiSalvo discusses psychological research that suggests Zimmerman may have reasonably believed that Trayvon was armed. As the title of the piece indicates, James Brockholm’s study, which will be published in the upcoming edition of Journal of Experimental Psychology, supports the idea that the possession of a gun will influence your opinion of whether those around you are armed. Brockholm’s conclusion is that a person’s ability to act upon certain impulses can “bias their recognition of objects… in dramatic ways.” In the study, individuals holding toy guns were more likely to believe a person had a gun than those who were holding a ball and who simply had guns in the room, but not in their hand. The article describes this as the “blending of perception and action representations” which cause those holding guns to believe others are too. The statute and others like it (e.g. Wisconson’s Castle Doctrine under which a homeowner recently shot and killed 20-year-old, unarmed Bo Morrison, without being charged) is meant to provide a means for people to protect themselves when actually threatened. Based on Brockholm’s research, the statute is actually allowing people to act upon perceived threat that is automatically enhanced by their ability to act against the threat. This research supports the idea that individuals with guns are likely to act frequently because they can act, and not because there is an actually threat. In Bo’s case, his hands were both in the air. 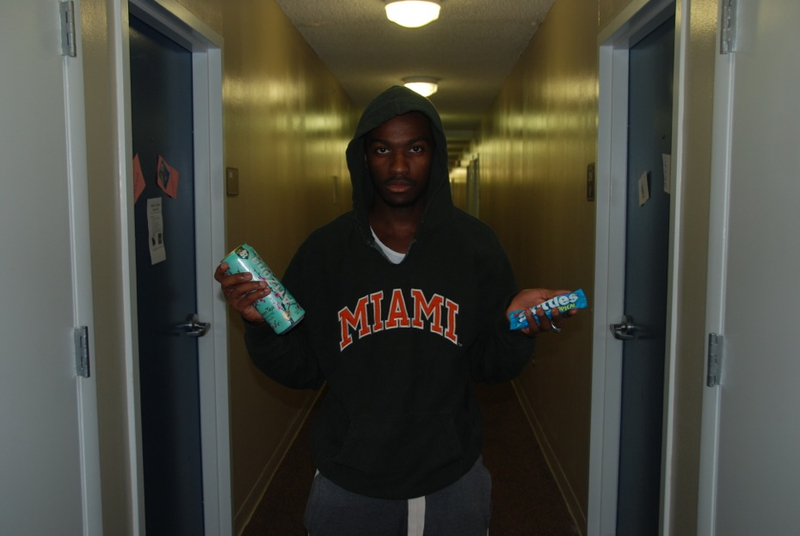 In Trayvon’s case, he was walking with a cell phone, an Arizona Ice Tea, and Skittles. Neither youth was armed. Neither was attempting to harm anyone. But two lives are lost, and importantly, two men have taken a life because they were able to, not because they had to. These statutes encourage violence by giving gun holders the right and encouraging them to “meet force with force” when the force they perceive will always be equal to the force they are capable of exerting themselves. These types of laws should be repealed immediately in order to prevent more innocent people from losing their lives and others from taking lives. the mere presence of a Black man…can trigger thoughts that he is violent and criminal. Simply thinking about a Black person renders these concepts more accessible and can lead to misremember the Black person as the one holding the razor. Merely thinking about Blacks can lead people to evaluate ambiguous behavior as aggressive, to mis-categorize harmless objects as weapons, or to shoot quickly . . . . The studies show that not only does thinking about Blacks make people think of crime, but thinking about crime makes people think of Blacks. These studies were intentionally done with both civilians and police officers. The officers were as susceptible to this association. Importantly, the study showed that when one is told to look out for crime, their visual attention focuses on Black faces. They may thus unconsciously avoid criminal activity of non-Black actors. For instance, when experimenters asked police officers “Who looks criminal?,” the officers choose Black faces more often than White faces. The study makes it clear that racial animus is not required. The association is automatic and is even sparked in Blacks and others minorities. Based on this research, Zimmerman may have associated Trayvon with criminality without having any negative opinions of Blacks. As a neighborhood watchman put on guard to look out for crime, he was likely looking for Blacks. Zimmerman was attempting to crack down on several robberies that had occurred in his neighborhood, and the possibility of criminal activity was salient in his mind, when Trayvon walked innocently by. Zimmerman may have reasonably believed that Trayvon was about to engage in unlawful behavior, but this belief was based on stereotypes and not supported by what was actually occurring. Section 1 of the statute protects people who seek out criminals and prevent their crimes from being completed. As people often unconsciously associate African Americans with crime, they may seek out African Americans engaging in ambiguous behavior percieve it as criminal. Acting upon this perception, they may attack (as Zimmerman did), under the protective shield of the Stand Your Ground Statute, leading to the harm of either themselves or innocent individuals. Based on this research it is clear that the first section of the statute puts a target on Blacks. The implications of the research that I have outlined in this section are that people who carry guns and seek out criminal activity will be searching for Blacks and will automatically associate ambiguous behavior with criminal activity. Laws like the “Stand Your Ground” statute give these individuals the right to act upon their perception and harm these Black people regardless of what they are doing. This means that Blacks in such situations will likely have no control over being shot or attacked. Even worse it means that individuals will be searching for Blacks and may unconsciously overlook true criminal activity in an attempt to find images that support their perception. We should not provide support for individuals to act upon irrational conclusions that are not supported by the circumstances. This does not mean that there should be no protection of individuals who respond reasonably to imminent danger, but we should require their perception to be supported by fact and not stereotype and thus require them to be able to connect their fear to something more than the person’s race. We should deem this on a case by case and remove the blanket approval of such behavior. People should be instructed to call police when observing unlawful behavior or to attempt to retreat when in fear of being attacked. Thus the statute should be repealed and self-defense should return to being a defense of murder, and not a presumption of innocence that must be rebutted. What happened to Trayvon Martin is an all too familiar story to many Blacks. We are profiled regularly based on stereotypes that we have no control over. As many of us mourn Trayvon’s death and remember many of our other brothers and sisters who have fallen victim to racial stereotyping, there is a concurrent legal movement attempting to shed some hope on the issue by bringing charges against Zimmerman. This movement should also focus on repealing the Florida statute. Once these actions are taken, we will be one step closer to Justice for Trayvon. *I would like to thank Anisha Queen, David Korn, James Smith, and Professor Jon Hanson for their assistance and inspiration with this piece. This entry was posted on March 26, 2012 at 12:00 am	and is filed under Implicit Associations, Law, SALMS, Social Psychology. Tagged: Criminal Law, Implicit Associations, mind sciences, prejudice, race, Trayvon Martin. You can follow any responses to this entry through the RSS 2.0 feed. You can leave a response, or trackback from your own site. I liked this article, which touches on a number of important points. On the statutory analysis, though, I think you should also focus on Section 776.032 (which I also missed in my initial writeup of this incident here: http://blackbooklegal.blogspot.com/2012/03/trayvon-martin-stand-your-ground-vs.html ). That section gives a defendant immunity from criminal prosecution, civil action, and even arrest. To get around the immunity, the police must have probable cause to believe the use of force was unlawful, which is the point I explore in my post. But I think that, although the 776.013 analysis weighs in favor of prosecution, the 776.032 analysis tips the other way (though not conclusively, and as I note, hinges on the meaning of the word “unlawful”). The studies you cite near the end of this article are all very good reasons the Stand Your Ground statute, and ones like it, should, at a minimum, be re-examined.